Before you start wondering what is happening on my blog, I will warn you that I ma experimenting. You remember I told you about a blog I want to start about food and travel stories? I have been inspired by so many of food-blogs that I want to start a place where I can share my kitchen creativity too (although I am pretty much sure that I won’t be half as creative as them because I do not have much time). Before I start the blog and buy a blank canvas, I thought about experimenting with at least one post at least so I know whether I will be able to bring my idea in pictures or not? Words won’t be a problem, I know, but pictures are just another story. I have been wondering this for three months now as many of the thoughts and pictures sit in the gallery of my phone. Then Delmonte provided me this inspiration. They challenged the blogger to cook the Pasta Italiano style. So, I am torturing my dear book lovers to go through a recipe only once and give me the feedback whether the pictures(and recipe) and my idea have the talent to keep a food and travel blog running? This is just one post, I promise, but I need someone to help me get over my insecurity. 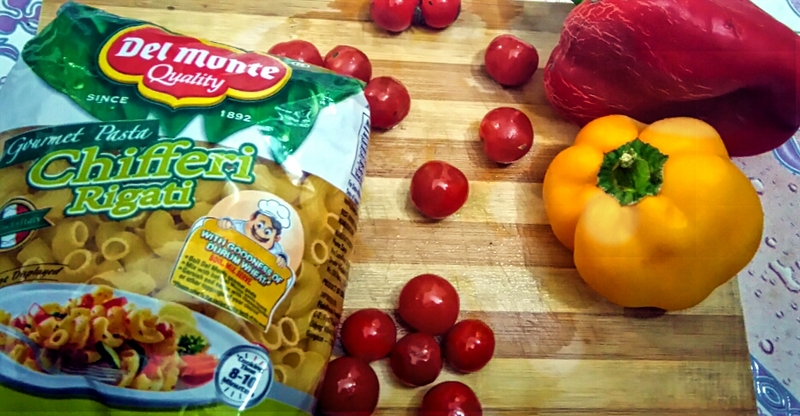 Before I start my pasta recipe, let me confess I have discussed with my fellow contestants about the recipes and I have discussed with them their favorite recipes too. I have highest respect for them because they spent one hour or sometimes more than one hour in preparing pasta. For me, pasta is a quick dish. When I come home from office and I am in no mood to cook, I cook a bowl of pasta. So, for me Pasta is at max a 20 minute dish. If we can refrigerate it and have it later on without reheating it, all the more better. This means that I can enjoy my pasta during my lunch in office. And to make it Italian I add what I consider as Italian ingredients. Not the freshest of the lot… but then I am not in Italy right now, and today is the weekday. So this pasta recipe incorporates that thought of mine. It is quick– 10-12 minutes of cooking time or the time it will take for the pasta to be cooked. That’s all the time you need. 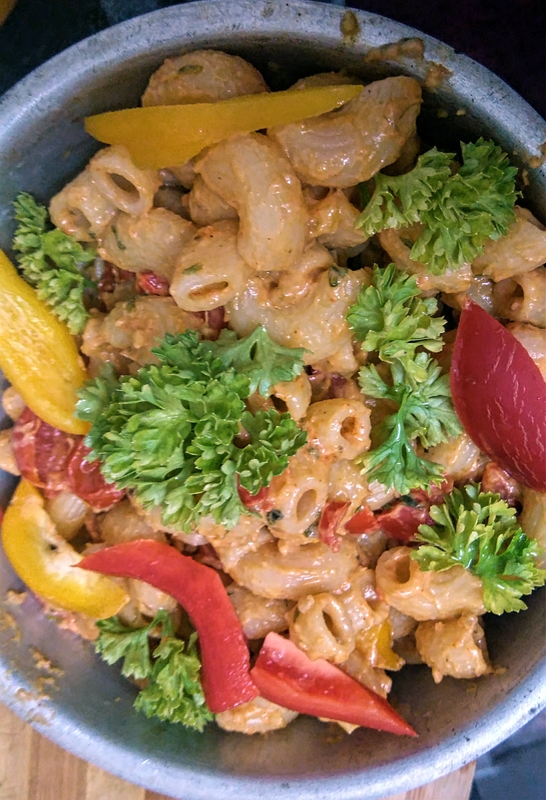 This pasta salad has the bite of apple cider and the crunch of peanut butter to form the dressing for the pasta salad. The pasta is boiled along with all the veggies (except the cherry tomato which I like to oven dry) with enough amount of water to cook it. Then it is mixed with the salad dressing. I like to refrigerate it before eating, but it tastes good when warm too. So let us move on to the recipe. Since I live alone, I have to cook only for myself. This recipe gives enought for one person. The first step is to boil the pasta. Just make sure not to add too much of water to the pasta. The double of the quantity taken should be sufficient for the first boil. Add a pinch of salt and a tablespoon of oil in the water to ensure that the pasta does not get sticky. While the pasta is boiling, put the cherry tomatoes in the oven for drying for 10 minutes. (I set the oven at 200 degrees for 10 minutes). Before putting in the oven, cut the tomatoes in half and add a drop of olive oil over them. I like to add dried oregano too to them because of its awesome fragrance and that subtle taste. 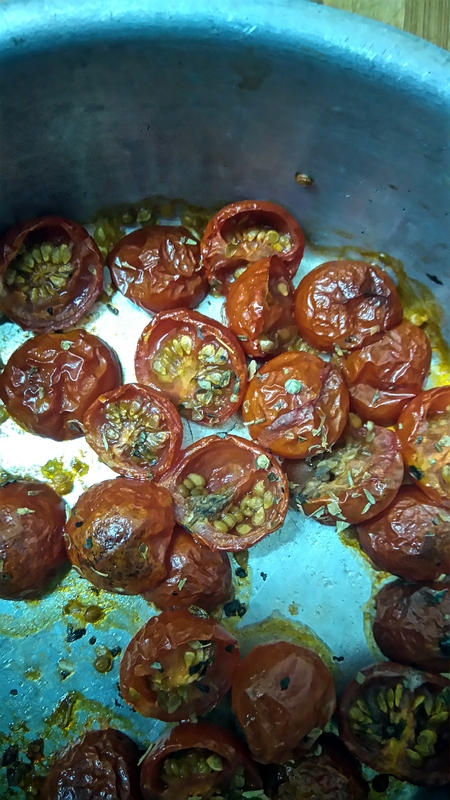 This is how the cherry tomatoes look after being cooked in the oven for 10 minutes. 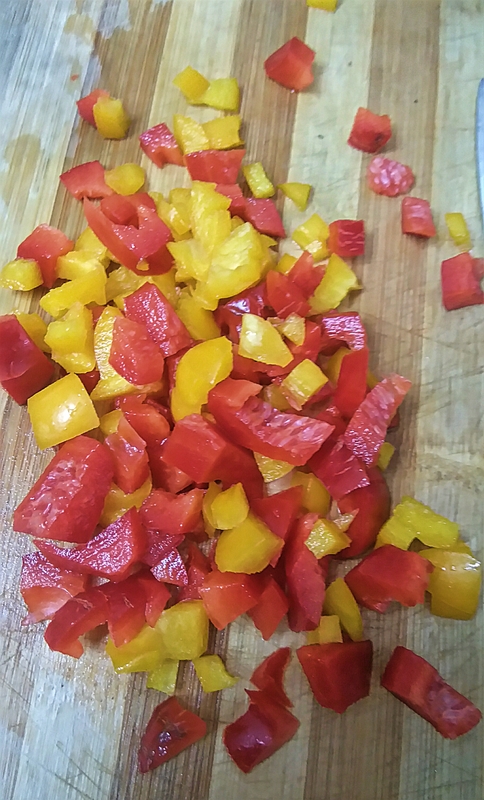 Meanwhile, cut the yellow and red capsicum. You can add the cucumber too (European cucumber tastes awesome in this too, but since I am new to Mumbai I could not find a single place which sells them). After pasta has boiled for few minutes, mince the garlic and add it to the pasta. Also add a few basil leaves and a bunch of parsley leaves. Let the pasta continue to boil. 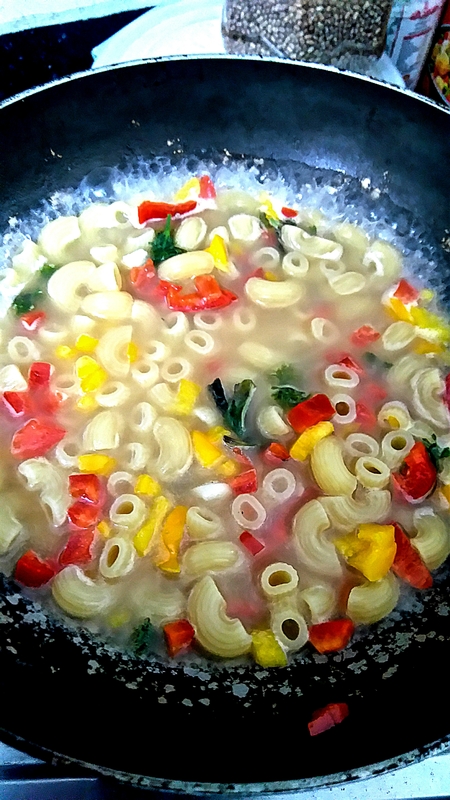 After around 7 minutes, add the capsicum to the pasta. 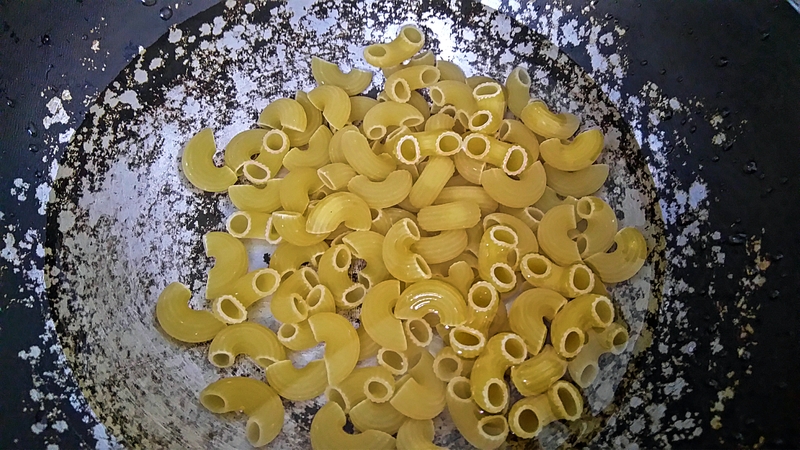 Adjust the water if needed and cook the pasta till al dente. This means the pasta should retain its crunch. This should take another 3-5 minutes. As and when the tomatoes are done, mix them in the boiling pasta. Take the pasta off the heat when only slightest amount of water is still left in the pan. It means that the pasta should not be completely dried but should be glistening with water. This will make it easier to add the peanut butter. Mix the peanut butter and the apple cider vinegar to the cooked pasta. Add the paprika and adjust the seasoning as per the taste. I like to add the hint of dried oregano and parsley for the taste and fragrance. Eat it warm or let it cool in the refrigerator overnight. 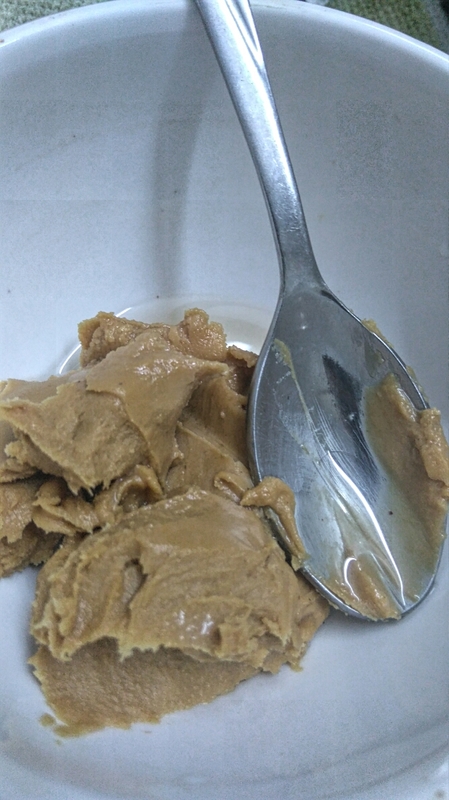 P.S.– In order to make the mixing of peanut butter easier, one can always blend it along with the apple cider as this will reduce its density a bit, but mixing it while the pasta is still hot and when it has the slight amount of moisture is actually not that difficult. And this is my fallback recipe when I am in no mood to cook or have no time to focus too much time on cooking. Do tell me if you liked the recipe (and if you think I will able to even 1% of the justice to a blog I want to start!) And even if you don’t think I can do it, that’s okay to tell me too. I am very soon going to bury this post under the deluge of book reviews that are pending, so that will be just okay. Can someone loan me Gupta Family? Have you ever read a book or watched a series throughout the night and then entered bleary eyed in the kitchen in search of a decent breakfast? If your answer is no, I will call you wise and pat your back. But sadly my answer to the question is yes. I have spent the nights doing either reading marathon or a series marathon and then searched the kitchen for breakfast. This sometimes involved cooking with half-closed eyes because breakfast is a very important meal for me. I can go whole day without food, but not without breakfast. These kinds of days are the time when I wish for a restaurant that delivers food at 5 or 6 in the morning (I am an early riser even when I haven’t slept for whole night),a place where I can order something healthier than chole bhature and kachori that early. And that is when I saw this advertisement. This ad is of Gupta family who is as addicted to breakfast as me and loves the variety in their food. They are using Kellogg cornflakes and have come up with recipes which are healthy, hearty and tasty. As the ad continued, I looked at my bland oats and milk combo and wished to be with Gupta family to enjoy the scrumptious dishes served on their table. Because even when I am not on night-watch, I still am rushing for office and sometimes, I have to make do with plain, old sandwiches. The lucky days are the one when I manage to get up in time and cook something elaborate and tasty. Can someone please loan me Gupta family which creates creative breakfasts or ask them to adopt me for breakfasts?Or they can cook and parcel me their healthy breakfast packet every morning at 6? For those who don’t know much about my real life, I am shifting from one city to another and this has made me worried. You see, it is a huge step for me as I will be leaving behind whole 30 years of my life for some time (or forever). I can’t say whether it will be for good or bad, whether it will be permanent or temporary, but it is happening. Sometimes I am at my wits’ end with the worry of how I am going to manage everything, while other times, I am pretty excited that I’ll get to explore the new places. Sometimes, I am pulling my hair at the exorbitant rent rates there, but the other times, I am sitting dreaming about all that city has to offer. Some two and a half years ago, I faced a similar dilemma. I decided to move out of my parents’ house and live independently. Everybody warned me not to do it. I was told that I would be VERY lonely, that I would not know what to do with my time, that I will suffer the boycott from the society and what not. It would be wrong to say that I did not heed that advice. I listened to all of them and would have followed that advice of settling with my family only if I could see some future somewhere. But the sad fact remained that I wanted to have a tangible place of my own to secure my future, and living with family along with paying for that place was simply impossible financially. So, I selected the option of moving out of my family house with a lot of trepidation. It has not been a very long time since I moved out of my parents house, but I have not repented my decision even for a moment for once. This move gave me an opportunity to grow as a person and expand my horizons. It gave me a chance to start this blog and watch all those movies and read all those books which were curtailed earlier because of limited space. More than anything it gave me peace of mind that if everything goes wrong in my life, I have my own home to come back to. Not many people understands this need of mine, but it is like a blanket of security of all my plans. Now, as I shift to Mumbai, I am again getting the same vibes from everyone, like I am taking a disastrous step. But sometimes, the option we select is the right thing. That is what I am trying to believe right now. 1) I am trying to be positive but I am worried. I am excited as well, but the fear of my not being to adjust is mixed with. 3) Last but not the least, I am hoping that this change in cities will bring some good tidings and open up some excellent avenues in my life. Have there been times in your life when you feel that everything is going against you? The kind of time when it feels that universe doesn’t want to be happy? I am not in that phase right now, but when the advertisements about optimism popping up on behalf of Housing (a new property search company) and all the uncertainty around me about being transferred to Mumbai for my job (more about that later), I was transported to that time for few minutes. This was in the year 2011. It had been an year since I separated from my husband and divorce proceedings were underway. There was a lot of tension in my family regarding my insufficient attempts about reconciliation etc. That was when I decided to buy my own car. I didn’t know driving then, but I had this belief that everything in my life will change if I learned driving. Now when I think about it, it was more about having control of at least one thing in life. I had always dreamed of having my first car as black in color. My brother told me to buy an old car and learn driving first, my friends were skeptical about my driving skills. My parents told me to at least buy a color which won’t show that many scratches, but still I was adamant. I brought the car and hired a driver to help me learn the driving. The first day I sat on the driver seat of the car, I banged my already-stopped car in a bus. All those warnings rang again in my ears. The driver who was designated to the passenger seat was bewildered that why didn’t I kept the brake pressed, why didn’t I put the car in neutral. I just gave him the keys and asked him to drive to my office. It’s difficult to explain that feeling of despair, but when almost everyone asked me what happened to my “new” car again and again, I was ready to go home and sell back my one-day old car at half the price. Probably I would have done so as well if not for the radio–my best friend. I had heard this song many times earlier as well, but this time song filled me with an energy, with the hope that even if everyone turns into a stranger, that God will never leave me, that there’s someone who is guiding me through these paths. That there’s somebody who’ll hold my hand even if the accidents happened. Now, I know driving and let me tell you, I’m a much better driver than my brother and many other people who laughed at me at that time. I am proud of my accomplishment. Do I feel that I was stupid at that time? I do, but then I understand why it was important for me to drive myself then. It was one sane thing in all the chaos around me, one thing that I could win. And the song is still the one source of inspiration for me, and it has the way of cropping up when I’m too sad. A few days back my company announced that we are shifting to Mumbai. It is not necessarily a bad thing, but then I have lived in Delhi for whole thirty years of my life. It will be a HUGE change. It will be an understatement to say that I was worried. I was almost in hysterics, thinking all the worst case scenarios, wondering about the very high rates of property. But then while traveling in the metro, someone’s phone got bonkers and this song started playing on the speaker mode instead of headphones. I know again this might sound like a some random happening, but to me it felt like cosmos is trying to tell me that I won’t ever be alone. That’s my story on how a simple song, one that has lost itself to the crowd of new songs, can still instil that sense of confidence in me. P.S.– To all my Mumbai friends, be ready to welcome me. I have to be there before 1st April. P.P.S.– Do check out the site of Housing. Awesome, awesome design. P.P.P.S- No, the worst case scenarios are not yet solved. The property rates are still my worry, but then I have realized that there are some things fated and predestined, some paths made for me specifically. Probably one such path is in Mumbai. I celebrated my 30th birthday on 28th Jan. It feels like I have crossed a milestone, and I have entered a new era. I always had this feeling that there is something waiting for me which I’ll get after 30. It has been two days since that and nothing has changed around me (for good), but still, I have this weird feeling that the something monumentally good is just around the corner now. Fingers crossed. But well, this post is to reminisce about myself, more like a letter to my own self. (I’m egoist that way I love myself more than anyone.) I’m donning my wise-woman hat and entering the mind of what I’d like to tell the “Doubting Thomas” part of myself. It’s alright to be an engineer and an amateur writer. It’s perfectly okay if you don’t want to be a professional or published writer right now. The people who think that you’re wasting your time by not adopting your hobby, probably haven’t lived in the financial insecurity which comes with owning of one’s own business. They probably have not felt the joy of seeing a building, designed by you, being erected; they probably haven’t felt the joy of letting your pen loose on the paper. Those engineers who think you’re wasting your time with writing and those writers who think that engineering eats away the creativity have not felt the pleasure of being the two together. Don’t mind them. Don’t let them rob you of either of your joys because they cannot comprehend being the two together. It’s okay to be romantic and practical.You might not be a dreamy-eyed anymore, but you still have right to weave your own dreams. It doesn’t matter that you don’t believe in love at first sight, it doesn’t matter that you try to see both pros and cons of everything including a relationship; it’s okay that you don’t want to save someone or comfort someone anymore– your romance has another dimension. You’re wiser than all those who think you’ve grown old. It’s okay to be religious and young. Don’t let the idea of the people that religion is evil influence you. Let them call you old-fashioned, but remember, they were not the one who gave you the courage to cover the paths of their life. They might believe that being an atheist make them “of this world”, but then always know that age and religion are two different concept. Religion is more about faith than about age. It’s okay to wear the salwaar-kameez and yet be modern. Don’t let the words of the people deter you that these dresses have gone out of vogue. You have never let them dictate what you should wear; don’t let them tell you that you’re quite “behind” the times. Western clothes in no way mean progressive thoughts. Wear what you feel comfortable in. Don’t mind being a cook and a working woman. Just because someone else doesn’t have time or aptitude for cooking food, doesn’t mean that you should also give up. Yes, it needs a lot of time, but it also releases your stress; it also makes you happy. Let them comment on how “behenji-type” is this. Last but not the least, you can be happy and alone. You’ve experienced this and you know this well. The people who says that happiness calls for a companion might be right too, but don’t think that you’re strange as you don’t have such need right now. You’re all of the above and so much more. The world cannot imagine having all these “and”s. They might try to cast you in a single mould, but you’re much more than one mould. You’re like water– you can be a well, a stream or a whole ocean; don’t let the labels limit you. More than that don’t let your joy be curbed by the comments of those with limited viewpoint. You might think that I’m crazy, but it’s good to remind myself why I defied every tradition. Sometimes the questions do get troublesome, sometimes this makes my life very difficult–but there is a reason why I am like this, and this little post is a reminder to myself. Hopefully coming years will add many more “and’ to this list. No, I’ve not lost my mind. No, I’m not trying to propose anyone through this post.In fact, I don’t have a crush right now, else I would have asked the question directly through the post itself. But with time, people too change. If you ask me today, how I’d propose my crush– my answer will be different from what I did last time although even that was nothing more than blurting out before the whole class and making a cake of myself. I am not an exhibitionist by nature. I like to act more like a silent force of nature, pulling everyone as I want. And the age has made me a bit more outright, a bit more confident, and of course, a bit more vary of the rejection. So, even though Close-up believes bolder is better, I will veer towards the personal confession and that too without any drama or show off. So, let me weave the scene now. Since I’m not the kind of person who could/would ask this question to a random person, the further story assumes that I’m already friends with the person. The timing of the question will be at the end of the drive so I don’t have to react immediately to the answer. If it’s a yes, then I can smile and dance and message to my heart’s content later on, and if it’s a no, I can cry my eyes out without further embarrassing myself. I know it is not as sensational answer as one will expect out of a romance reader like me, and probably things will turn out differently. It depends on the extent of emotional involvement– as I already said, I can even propose through a post like this, but this sounds like my most ideal, level-headed dream. Laundry and the traditional role of women– My Monday Musing. My Monday musing for today is inspired by the book I had recently read called “The Guest” and the Korean serial I’m watching called Misaeng. Both the things show the struggle of working women with their personal lives. While book’s main focus is the adjustments between the newly wedded couple, the series focus on work-home balance. Then, the group Blogadda came up with a contest called #IsLaundryOnlyAWomansJob, and this musing was originated. We live in a world where both men and women work, where sometimes women earn more than men– but when both come home at the same time, it’s the women’s duty to make that tea, or when it comes to household chores (and this includes managing the servants/maids as well), it’s a women’s responsibility. When I was a kid, the first thing that was instilled in me was that studies are very important, but equally important is to learn the household work. My mom used to say that I’ll have to know these household chores even if I take the post of President of India or of world. Her words till date are: “Work is at its place, but you would never be able to delegate the responsibility of these chores on anyone else.” And after almost twenty year of this lesson of hers, I know she was right. Today, when our society is coming out its shell, the scenarios have changed a bit. The husbands and sons have taken some load off the females of the house. But then have they truly taken the load off? Washing machines have made the job easier, but then there is still the decision of sorting the clothes according to color, deciding the wash cycles of those machines and then rinsing them is still a female’s job. 1) Both husband and wife have returned after a hectic and tiring day at the same time. Both are sitting and resting themselves. The cook arrives. Who do you think will go to check on the cook in the kitchen? 2) Maid is on leave for a week. Who do you think will bear the major burden of this leave? 3) There is an urgent meeting for the husband. The wife already had her day planned to the last minute. Who will now go and pick up the child from the daycare? Now reverse the situation. Wife gets an urgent meeting call, and husband’s day is already planned. Again, who do you think will sacrifice their work that day? I am not sure what your answer to above situations were, but these are true and seen situations. In fact, today itself I was arguing with my friend who wanted her wife to be home by 6 so she could take care of the chores. He also wanted her to earn sufficiently as per her qualifications (which are way better than his). So, I do agree with my mum. Women may reach the sky, but then they’ll still have to bear the burden of those chores. They’ll always have more balls to juggle than their male counterparts, and they’ll forever be guilty for neglecting those 1001 things. So there ends my Monday Musing for today– a bookish-bloggish-serialish–kind of musing. I am writing for #IsLaundryOnlyAWomansJob activity at BlogAdda.com in association with Ariel.